We asked long-standing Liverpool Irish Festival friend Gerry Ffrench to give us some information on her roots and current work, ahead of a performance of self-penned music and songs over at the Albert Docks for the Three Festivals Tall Ships Regatta (the late May bank holiday weekend 2018). Gerry has sung in festival sessions and in 2017 played Master of Ceremonies for our Visible Women evening, over at the Philharmonic Music Room, introducing Emma Lusby, Mamatung, Sue Rynhart and Ailbhe Reddy. We regularly talk about the books that Gerry has planned, stories from her father’s life and the incredible influence of Irish history of Liverpool life. Gerry is the winner of Folk Northwest’s talent showcase, which took place at Costa del Folk Portugal in 2017. A singer songwriter from Liverpool, Gerry has strong family links in Wexford and Mayo. She is a popular performer in folk clubs in and around Merseyside – and the North of England – as well as appearing at various folk and shanty festivals here and abroad. 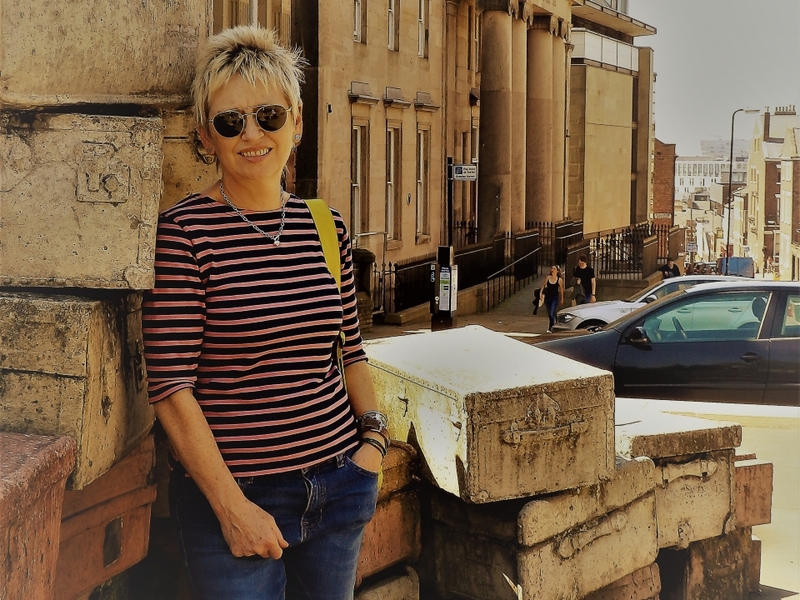 Currently working on her third full studio album of original songs in Angel Valve Studios Oxton (Birkenhead), Gerry uses the stories of ordinary people of the city – past and present – as an endless source of inspiration for her songs. Gerry’s new album, Rivercity Echoes, runs as a succession of stories, intertwining Irish and Liverpool life. Rivercity Echoes will have eleven original tracks, all composed, sung and played by Gerry with almost every track telling a story. Through these stories, Gerry speaks of times gone, of love and loss and of today. Below is a breakdown of those stories, as described by the artist. When Paddy Came Marching Home is about a whacky Irishman who in 1939 joined the Royal Navy, didn’t like it, so enlisted in the army while on leave, eventually fighting his way from North Africa all the way to Germany. Do Your Washing for a Penny was inspired by the great Liverpool Irish philanthropist Kitty Wilkinson*, originally from Derry, who was instrumental in setting up wash houses in the slums of the city, after saving many lives during the cholera epidemic of the 1830’s. * #LIF2018 features a play on this subject, by Carol Maginn called Kitty. To keep up to date with our programme (announced from summer), sign up to our mailing list. We usually send no more than one mail per month, rising nearer to the festival with event news. We never sell any data. The Admiralty Regrets is the half-forgotten story of the Thetis Submarine disaster in Liverpool Bay. It was triggered by seeing 99 men’s names on the steps of the bell tower in Birkenhead Priory, right next to Camel Laird’s where the sub was built in 1939. I wrote My Brother’s Shoes after seeing a pair of combat boots, left by a veteran, at the Vietnam War Memorial in Washington DC seven years ago. Dorothy Drew retells the story a popular traditional folk song The Callico Printer’s Clerk – from the point of view of the female protagonist. Bound For Glory was written after a fan suggested I check out the history of the Isle of Mann Packet ship The Ben Ma Chroidhe, which sank off the coast of Turkey during the first wold war.